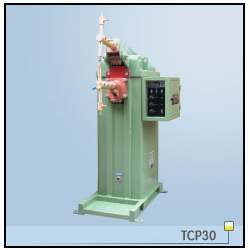 Now TCP series machines are standardized with DS33A synchronized panel. The anti-saturation technology has effectively dismiss the spark on job. High speed welding in "Auto Repeat" mode with a minimum of 0.02 second weld time. Synchronized linear Thyristor control power setting.